This PDF 1.7 document has been generated by Sejda 3.2.65 (www.sejda.org) / SAMBox 1.1.45 (www.sejda.org), and has been sent on pdf-archive.com on 22/12/2018 at 16:20, from IP address 144.64.x.x. The current document download page has been viewed 53 times. File size: 914 KB (6 pages). Keywords: multiple smart home; controlling system; database replication. security  , personal comfort , and energy conservation . Design Master on a network server. services, also it can easy to access from the remote location using www on HTTP services. monitoring system. The concept is how the smart home server gets the command from the user. make command and keep that command data in the online database. It is Show in Fig 1.
database gets the command controlling from a user. It's Show in Fig 2 and Fig 3. Fig. 1. Smart home database replication. Fig. 2. Direct smart home controlling. Fig. 3. Non-direct smart home controlling. single online database. It's Show in Fig 4.
permission for each user to control their own smart home. It's shown in Fig.5 and Fig.6. controlling and monitoring page and we can monitor the status port of the electronic equipment. Fig. 4. Multiple smart home server controlling system. Fig. 6. Controlling and monitoring page. seconds. And the last OFF on 30th July 2018, at 12:07:57. R. Kadam, P. Mahamuni, and Y. Parikh, “Smart Home System,” Int. J. Innov. Res. Adv. Eng., vol. 2, no. 1, pp. 2349–2163, 2015. Technologies and Applications: Wireless Protocol Assessment for Home Area Network Resources, vol. Home Network Applications,” J. Sensors, vol. 2016, 2016. Control System for Classroom,” Proc. 2016 Int. Conf. ICT Business, Ind. Gov. ICTBIG 2016, 2017.
vol. 3, no. 6, pp. 155–159, 2016.
through Voice Command,” Int. J. Adv. Comput. Sci. Appl., vol. 48, no. 17, pp. 35–39. Automation Systems -A Study,” Int. J. Comput. Appl., vol. 116, no. 11, pp. 975–8887, 2015. Elderly and Handicapped People,” 21st Int. Conf. Adv. Inf. Netw. Appl. Work., 2007.
and their extension to smart buildings,” Sensors (Switzerland), vol. 15, no. 5, pp. 10350–10379, 2015. Actuator Network Design for Smart House and Home Automation,” J. Sens. Actuator Networks, vol. 2, no. 3, pp. 557–588, 2013.
of home appliances using mobile telephony,” Int. J. Smart Home, vol. 2, no. 3, pp. 37–54, 2008. Int. J. Inf. Futur. Res., vol. 2, no. 8, pp. 2547–2551, 2015.
about Smart Objects, Sensors, and Actuators,” Int. J. Interact. Multimed. Artif. Intell., vol. 4, no. 3, p.
Information, vol. 7, no. 3, p. 44, 2016. Resilience of Smart Home Environments, vol. 153, no. December. 2015. Environment : A Content Analysis in Web 1 . 0,” Int. J. Smart Home, vol. 7, no. 4, pp. 47–60, 2013. Implementation,” Acta Polytech. Hungarica, vol. 11, no. 3, pp. 51–63, 2014. 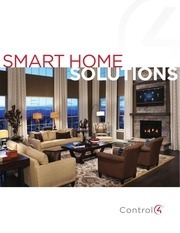 A. S. Dicarlo, “Smart Homes--home automation,” Livable New York Resour. Man., pp. 1–8, 2011. Online J. Power Energy Eng., vol. 2, no. 3, pp. 223–227, 2011. Prototype,” Int. J. Smart Home, vol. 7, no. 1, pp. 47–66, 2013. S. Kumar, “Ubiquitous Smart Home System Using Android Application,” Int. J. Comput. Networks Commun., vol. 6, no. 1, pp. 33–43, 2014. Android Application and Microcontroller,” Int. J. Sci. Eng. Res., vol. 5, no. 5, pp. 935–939, 2014.
technologies influence control over energy use and domestic life ?,” Eur. Counc. an Energy Effic. Econ. 2015 Summer Study Energy Effic., pp. 1021–1032, 2015. M. C. Mazilu, “Database replication,” Database Syst. J., vol. 1, no. 2, pp. 33–28, 2010. This file has been shared by a user of PDF Archive. Document ID: 01903223.